Just before we left on our vacation I made Garlic Scape Pesto. A little pesto goes a long way, so we ate a little of the pesto on a bowl of black beans. In order to save the pesto until we returned, I froze the extra pesto – cheese, nuts, and all. All I did was simply press some plastic wrap on the top of the pesto and stick it in the freezer. The day after we returned the kids needed some lunch. Presto pesto: I boiled a pound of rotini and tossed it with the thawed garlic scape pesto and then sprinkle with black pepper, a pinch of salt, and some shredded romano cheese. It tasted just as good as the day I made it. So for today I say: garlic scape pesto freezes well in an airtight container. Allow time to thaw before using. Hello! 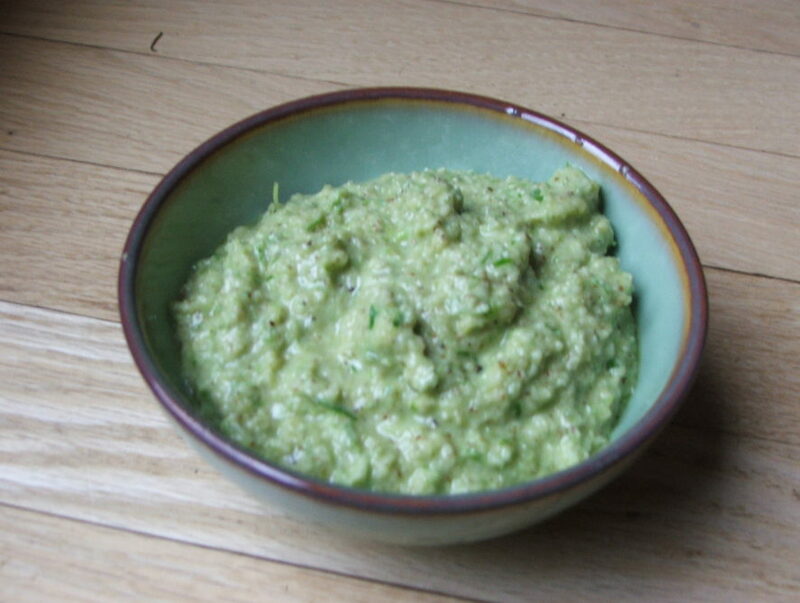 Thanks so much for posting the Garlic Scape pesto recipe! I got my organic foodshare box yesterday afternoon and came home terrified of this new curly green vegetable! I had never seen garlic scapes before. So, I googled them and came upon your wonderful blog. I didn’t have walnuts, and made the pesto with roasted almonds instead and it came out great. I love your blog and have posted a link to it on my birdwatching blog:) So glad the garlic scapes made me find you! Thanks for your kind note. The garlic scape discussion has created quite a bit of traffic on this site. Until I grew my own garlic I wasn’t sure what garlic scapes were, how they were harvested, how they tasted, or how to use them in a recipe. Another benefit of gardening or joining a CSA. When we’re connected to our food in this way we learn much. Look forward to seeing you around the blog again.